Originally from Los Angeles CA. Tracy began his career in aviation when he joined the Army in 1987. During the twenty years with the army he was a mechanic /crewcheif on the OH-58 Kiowa, UH-60 Blackhawks and the UH-1H Hueys. As a crewcheif Tracy has flown over 2,000 hours and did deployments to Somalia, Central America and Iraq. After retiring from the Army Tracy worked on the TH-57 Sea Rangers at the naval test and evaluation squadron HX-21 until 2015. Tracy’s next adventure was to McAllen TX. Where he worked on AS350’s for the Customs and Border Patrol. 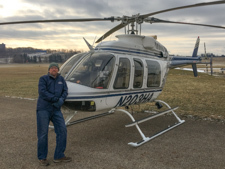 In 2016 Tracy joined the Heloair team as a Mechanic/ aerial observer for gas pipeline patrols. Tracy enjoys spending his time with his wife and three kids tending to their horses and chickens.